Hi Allie, McMurphy here live from Mackinac Island. 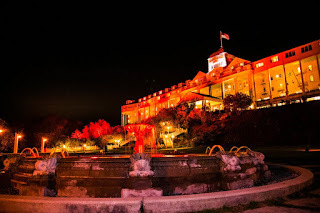 Last year the Iconic Grand Hotel held it's first Halloween celebration. You can read about it and see more pictures by clicking on the caption link. I can't wait for my first Halloween on the island. But before that happens, I have a few more murders to solve and a whole lot of new fudges to create. My next adventure takes us to visit the iconic Butterfly House and Insect World. In Oh Fudge, you will get a twisty look into my August and Frances's and Douglas's wedding. Yes! They are getting hitched! I'm so happy for them. I wish I were as happy for me as my love life takes some turns of it's own. For Halloween, Mal and her friends are dressing up as Wonder Woman, Batman and Superman. I'll have my author post pictures next month. What is the best pet costume you've ever seen? Comment below and don't forget to preorder "Oh Fudge" now. I love Batman. :D Thanks for commenting! My golden was a wizard. He wear the hat all night. He loved the kids. He loved visiting Mackinac Island. He was there twice. We live in Michigan. I already pre ordered. Love the mysteries, pleases keep them coming.